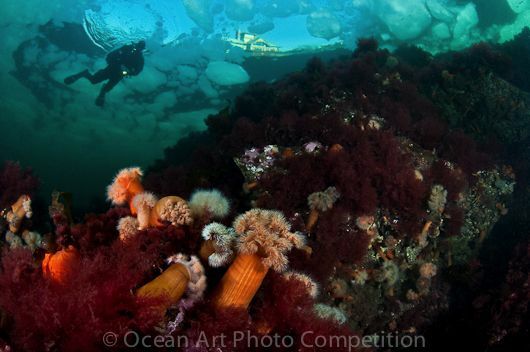 Lill Haugen, winner in the "Coldwater" category of our 2011 Ocean Art Contest, shares how she got her shot in the frozen waters of Norway. My winning "Coldwater" shot, "Frozen Fjord," was taken under the ice in the frozen Oslo fjord, near the capital of Norway, in -2 ºC (28.4 ºF) water. 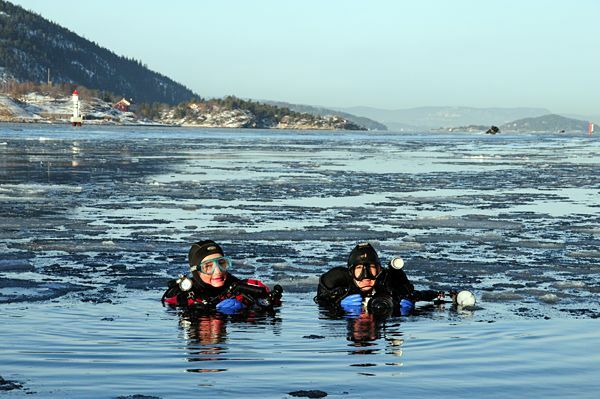 The Oslo fjord is known for diving that is, well, less than perfect, or "inconsistent" at best. With its notorious brown/green water and low visibility, diving here can be an unimpressive and muddy experience, especially compared to the western and northern parts of Norway with their lush kelp forests, rich fish life, and clear blue Atlantic water. Nevertheless, with well over a million people living nearby, the Oslo fjord is by far Norway's most explored fjord. Ship traffic, boaters, anglers, cabin cruisers, and naturally divers frequent it because of its easy access only a short distance from the city core. The visibility varies from day to day throughout the year, influenced by currents, algae, wind, and precipitation. The water in the Oslo fjord comes primarily from the Skagerrak, which receives water flow from the Atlantic Ocean via the North Sea, but also from the Baltic Sea. The Oslo Fjord, Norway, taken that day. With the cold winter season comes better visibility, when the water reaches extremely low temperatures and high salinity. 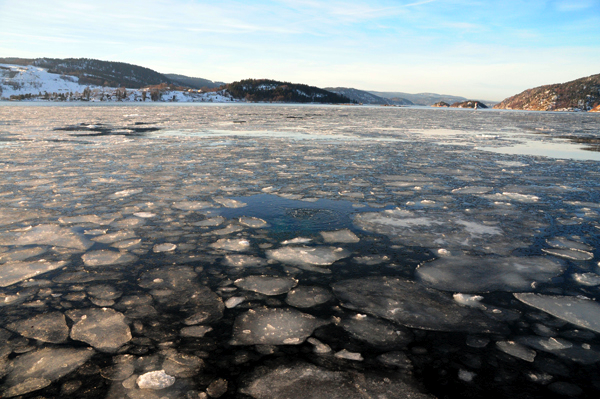 This is when divers in Oslo are tempted out of their warm homes to dive in clear blue water, which, unfortunately, often gets so cold that it freezes, despite being full of salt, and divers must contend with the ice. My photograph was shot on a freezing cold day in January 2011. This dive site was one of the few where the ice had cracked, just enough to allow divers to access to the water from shore. The air temperature was -15 ºC (5 ºF), which made us frozen stiff before we even got into the water. 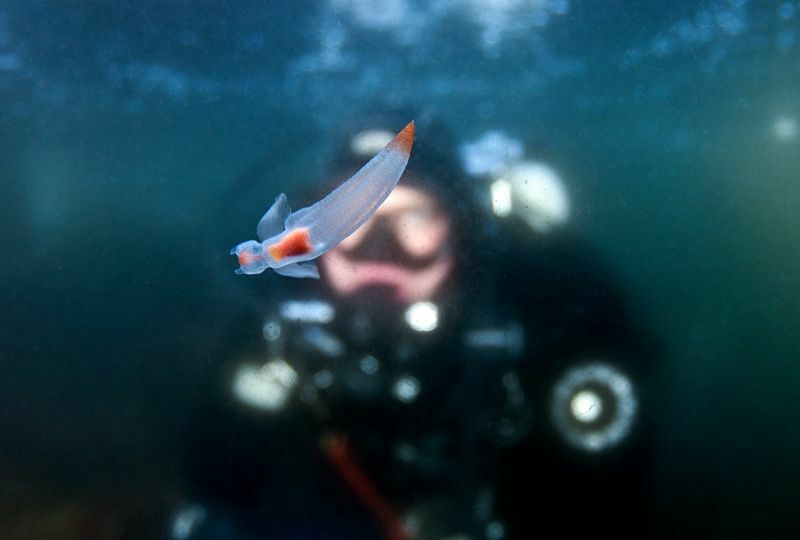 My primary goal was to do a short macro dive to photograph sea angels in the shallows, the beautiful coldwater-loving plankton (Clione limacine). Diving in such low temperature waters is painful, let me tell you. Despite wearing heavy duty dry suits and multiple layers of warm clothes, even dry gloves, we got very cold, very quickly, which made it hard to move and even harder to operate the camera with half-frozen fingers. 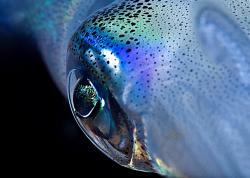 Photographing sea angels in the shallows. Even so, the good visibility lured me back into the water for a second dive, this time to shoot wide-angle with a 10-17 mm Tokina fisheye lens. I wanted to capture the beautiful shallow reef covered by plumose anemones (Metridium senile). Since the sea appeared clear and calm, I also wanted to capture the blue water with the floating ice flakes bobbing at the surface, the blue sky, and a building in the distance (which is actually a marine biology research station of the University of Oslo). I found the perfect spot where all of this could be combined in one image. Keeping the low winter sun behind me, I instructed my model to swim into the image above me. Holding my breath for a few seconds to keep the surface smooth and to avoid the “drizzle” of the bubbles hitting the ice, I gently lit the foreground with two strobes set in manual and my perfect shot was captured. My image was shot with ISO 400, shutter 1/100 and F9, using a Nikon D300 camera in Nexus aluminum housing with a Bare mini dome port designed Barry Guimbellot and two Inon z-240 strobes. 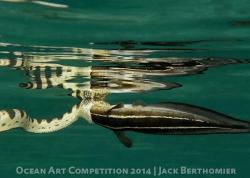 You can find out more about Lill Haugen and her photography on her website, www.lillhaugen.com.